Simply this is best buy FPV camera in its range of price. Its small, durable and great quality picture cam. Commends for RunCam in all. Absolutely love these products. The image quality is mind blowing and I couldn’t be more excited. RunCam for life! Very grateful to have this runcam mini . It save a lot of time and space for my quad . Thanks you runcam. I love this Camera, I will use them on all of my future builds, the dynamic range is fantastic. i bought the swift mini thinking it had osd, it doesnt oops. even with that disappointment i am really delighted with the mini, its the best fpv camera possible. and on a sidenote, i live in scotland and the mini turns a dark overcast scottish day into a bright contrasty colourful image to fly with... thanks runcam....>wipes tear.... thanks man. I think from the 3 runcam i have this is my favourite one, the lents fit inside the frame , the body and the mount are more robust and eficient for crashes. And you can use. It with high voltage that mesns perfect for 5-6S batteries . My favourite runcam for sure! Best FPV I've had to date. And that includes the Runcam Eagle. I bought an Alderboy canopy from Shapeways especially for this camera and my Atom, that suffered from being a great quad by the inferior tiny CMOS camera. Well what can I say. RunCam have done it again. CCD quality, Rotor Riot tuned with the supplied lead and just amazing. When your building quads for as long as I have you end up knowing not to bother with alternatives, just use the best, and RunCam is my go to camera everyday. First off it's as good a camera the regular swift. Plenty of hardware opinions for mounting. I don't use Any of them so I can't comment on how good they are. All I've ever needed are two center mounting holes. Which has always meant that I have to change out the case. In the past with out fail after the swap the board would rattle inside giving bad vibration in the video. I'd gotten into the habit of putting a piece of foam between the board and the back plate. 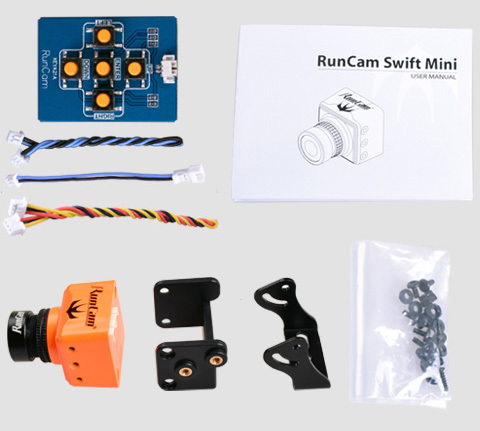 Seems Runcam has fixed that issue in the mini and the swift 2. Calling it mini feels like a far sthrech. The body is thinner width and height but is longer. It's the same length back plate to lens so in the end it takes up the same volume of space. In fact when I weighed next to the og swift it was actually a half a gram more. Despite my disappointment that it's not really mini, the form factor does help in tight builds. I switched out the stock camera on my Diatone Tyrant S with the RunCam Swift mini and the difference is amazing. I have more confidence in my flying now. Great FPV camera. Great little FPV camera. compact in size so it fits in tight places(used mine to replace stock camera on shrunken 180) great quality like the rest of the run cams.